April 4, 1979 – The Chicago Tribune reports that the Illinois Central Gulf Railroad has entered into an agreement to unload a 37.18-acre plot of vacant land on the city’s Near South Side. Park Development Associates of Northfield, the proposed purchaser, has tentatively agreed to buy the property for $24.2 million. 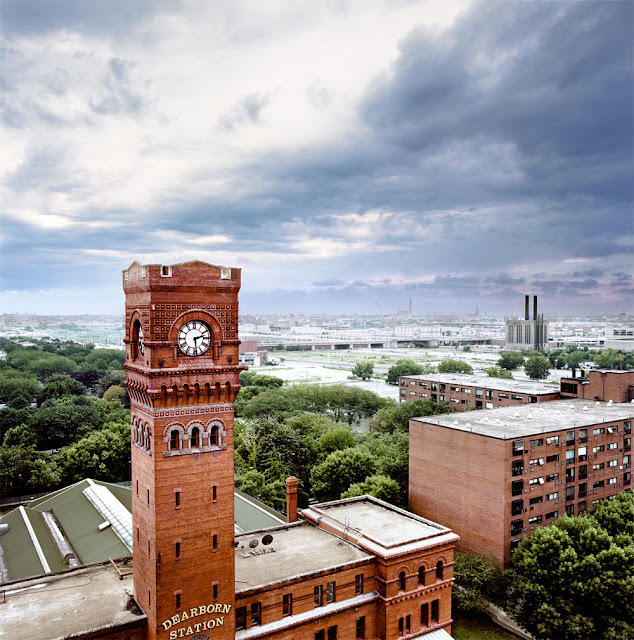 The sale is contingent upon approval by the Illinois Commerce Commission and the city. Edward J. Young, a partner in Park Development, says that the plans for the property are “not that far along … An industrial mart is just one of the ideas we are kicking around. We had to give the railroad some idea of our ideas, but there is nothing in writing, no contracts.” [Chicago Tribune, April 4, 1979] The northern portion of the plot runs between Eleventh and Fourteenth Streets with Indiana Avenue on the west and the I. C. tracks and Lake Shore Drive to the east. The negotiated price is $18.00 a square foot for a total of $13.2 million. Park Development also has an option to buy the land between Fourteenth and Sixteenth Streets with the same east and west boundaries as the northern segment. The purchase price for that section is $12.50 a square foot for a total of $11 million. Back in the late 1970’s virtually no breathing soul in the city could imagine anyone living in this area. The map above shows the property highlighted in red and tells the story of an amazing transformation from an industrial no-man’s land to one of the newest and most popular residential areas of the city. April 4, 1974 – At a meeting of civic and business leaders in the Bismarck Hotel a proposal is made to create a corporation that will make the New Town development project in the South Loop a reality. 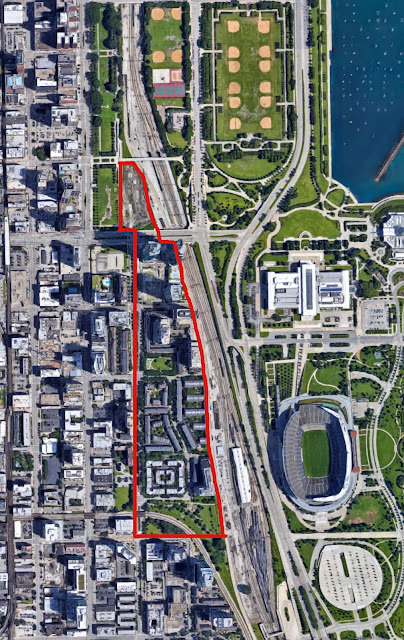 The agreement would see Chicago 21 Corporation selling $30 million in stock to fund the initial development of the area bounded by Congress Street on the north, Cermak Road on the south, State Street on the east, and the South Branch of the river on the west. Some 40,000 families, it is anticipated, will one day settle in this area of unused railroad land. Negotiations with the 19 railroads involved in the project are seen as comprising the biggest hurdle for the plan. With two principal goals at the heart of the development, backers are optimistic. Reports the Chicago Tribune, “It is considered by its backers to be the answer to flight to the suburbs by whites, and the prime means of beefing up the simultaneously booming and decaying central area. [Chicago Tribune, April 5, 1974] In reviewing these goals, Philip M. Klutznick, chairman of the executive committee of Urban Investment and Development states, “I firmly believe that the time is long gone when [suburbanites] can leave the Loop at 5 o’clock and simply leave the problems of the city behind them.” [Chicago Tribune, April 5, 1974] Construction of the first phase of what would come to be known as Dearborn Park began in November of 1977. Although it was an ambitious project, it was far smaller in scale than the New Town plan announced back in 1974. The above photo shows what the area south of the old station looks like today as development continues. Development has increased dramatically with the continued building along the east side of the river north and south of Roosevelt Road. 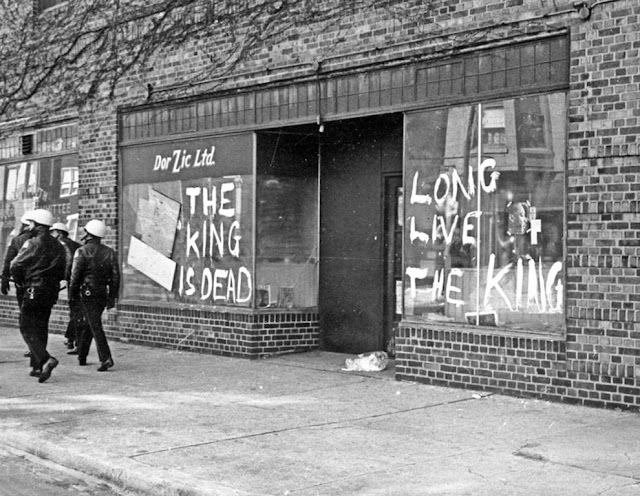 April 4, 1969 -- Although National Guard troops are withdrawn from the streets of Chicago, police patrols are increased in an attempt to prevent more violence after two days of fighting, rock throwing, gunfire, and looting that leave 96 injured and 271 under arrest. A 7 p.m. to 6 a.m. curfew is in effect for those under the age of 21 and a ban exists on the sale of gasoline in cans or portable containers, guns, ammunition and liquor in troubled areas throughout the city. The disturbances begin at various schools across the city as ceremonies are held to mark the memory of Dr. Martin Luther King a year after he was felled by an assassin's bullet on April 4, 1968.